Are you afraid of bridges? I wouldn’t blame you if you were. 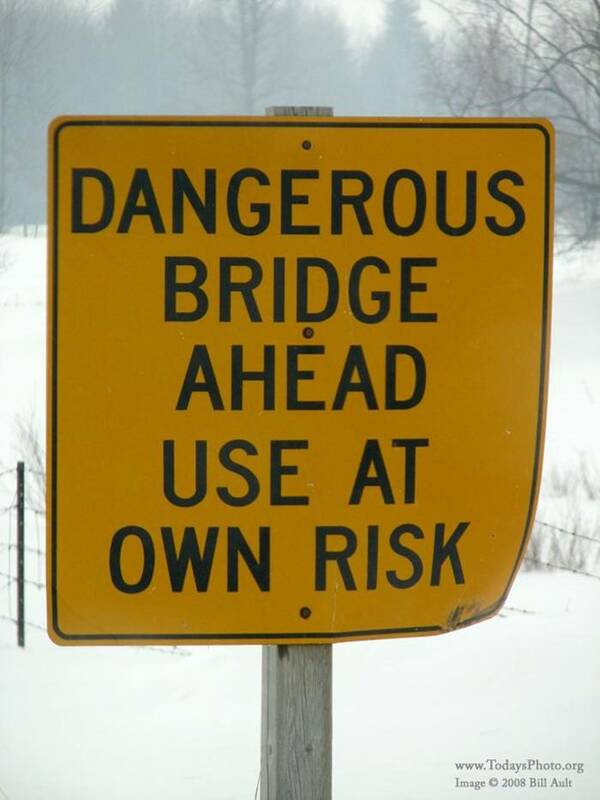 While most bridges we see and travel across on a regular basis are soundly engineered and reasonably safe, not all bridges are alike. 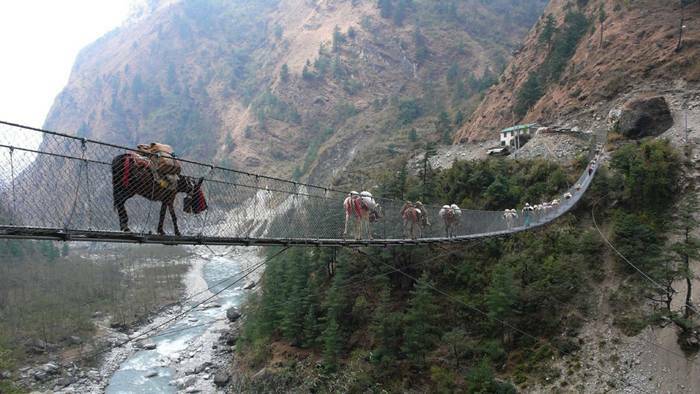 Ghasa Bridge is a suspension bridge on the south side of the Annapurna circuit. It was created out of necessity and in hopes of eliminating the congestion in Ghasa town due to herds of animals constantly being walked up and down the narrow roads. U Pain Bridge, one of the favorite spot of Mandalay’s Thingyan festival goers, was found jammed packed with visitors all over during the holidays of Thingyan Water Festival. Especially under bridge, visitors found themselves enjoying food at make-shift temporary “floating” restaurants. The stall were selling coconut juice, Beer-like Palm liquor, Beers, all kind of hard liquors and variety of Burmese traditional snacks and salads. 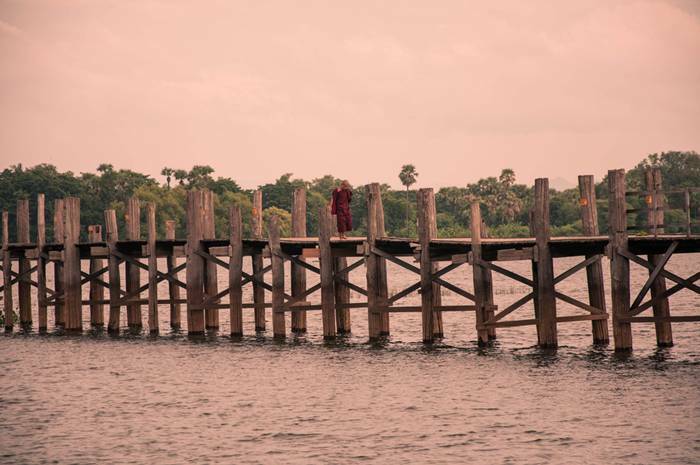 It may seem that only monkeys could make it across traditional monkey bridges—after all, they’re typically made of a single bamboo log and one handrail. However, the name comes from the stooped monkey-like posture you have to maintain when crossing, so as not to plunge into the river below. Where: Various points across the Mekong Delta at the southern tip of Vietnam. Stats: These bridges are built by hand by local residents and vary from town to town. Newer ones are made of concrete. 07. 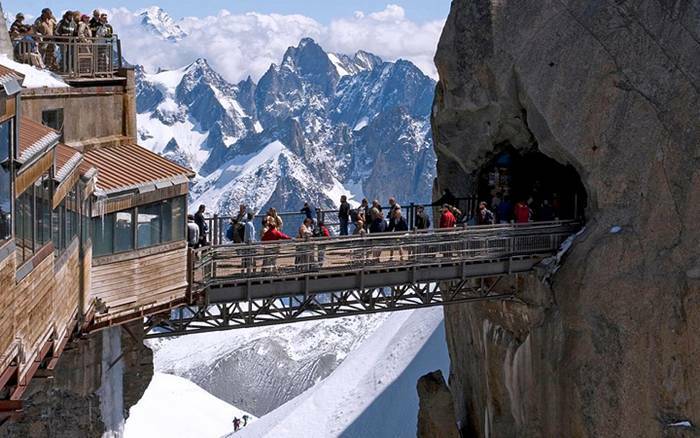 Midday Pick Bridge (Pont de l'Aiguille du Midi), France. This bridge connects the two rocks. Midday Pick a small bridge over the length, but due to the height at which it is located (3842 meters above sea level), seems to be endless and terribly dangerous, especially for those who are afraid of heights. Deliver tourists to the bridge on the cable car. The bridge is an excellent viewing platform of the massif of Mont Blanc, with his very visible peaks of France, Switzerland and Italy. Bridge Pont de l'Aiguille du Midi - one of the main attractions of the western part of the Mont Blanc massif. 06. Thrift Bridge, Canton Bern, Switzerland. 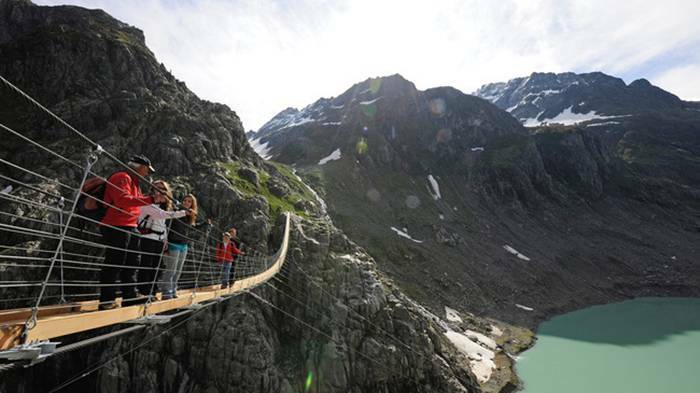 The longest and most terrifying suspension bridge in Europe. Built in 2004, the energy company for maintenance work on the glacier Thrift, and in 2009 renovated. During the reconstruction of the cable car system was reinforced bridge, then the bridge was opened to public access, and immediately became a place of pilgrimage for travelers seeking thrills. The bridge has a length of one hundred seventy meters, a width of one meter and is situated on an altitude of about a hundred feet above the lake Thrift. Bridge at walking shakin that adds excitement. Although architects and assure that the bridge is safe, that it can withstand winds of up to 200 km / h and a mass of snow and 500 tons of Thrift Bridge opened only in calm weather. Perhaps the organizers of these trips over the bridge spare feelings and the vestibular apparatus tourists. From the bridge of Thrift Bridge offers spectacular views of the Alps and even on the part of Italy. 05. 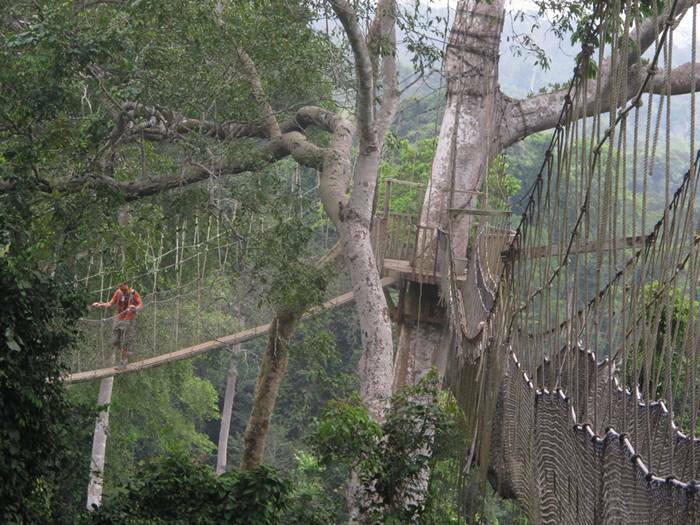 Suspension Bridge, Canopy Walk, Ghana. Kakum National Park has walking paths, bridges or rather, from which you can explore the wildlife from above. The most famous bridge Canopy Walk. This bridge was completely gossip from ropes, has a length of more than three hundred meters and a height of about forty meters. To pass through it, the person is not to be fear height. In addition, the bridge is very narrow, and it can go on just one person, counter travelers categorically excluded. A narrow wooden plank so much wobble in the air that rope fence in the growth of the person does not give a sense of security. 04. Suspension bridge over the River Capilano, North Vancouver. Capilano built in 1889. 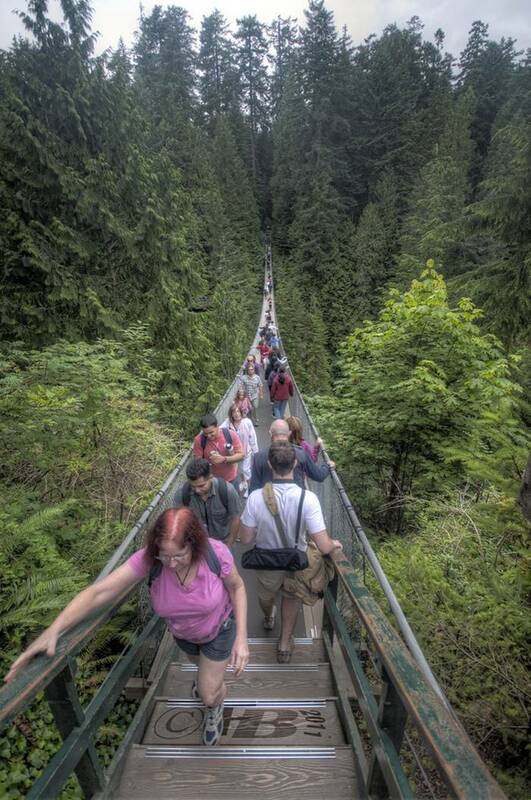 This bridge has a height of 70 meters and a length of 337 meters, is located in the evergreen forest near Vancouver over the river. The bridge is a rather precarious construction - cedar strips are connected by steel cables and much shaking when walking on them. With the opening of the bridge are great views of the nature of Canada, which, in spite of strong instability of the bridge, it attracts a lot of tourists. 03. Rope Bridge Carrick-a-Rede, Northern Ireland. This is popular with tourists bridge near the town of Ballintoy in County Antrim. 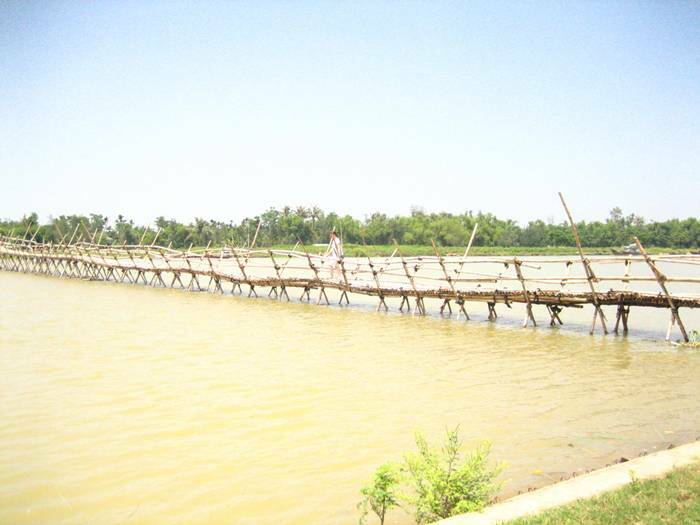 Cable bridge was built by local fishermen. Initially the bridge railing was only on one side. When he became popular with thrill-seekers, the National Trust of Ireland slightly upgraded bridge, providing it with the second-row railing. 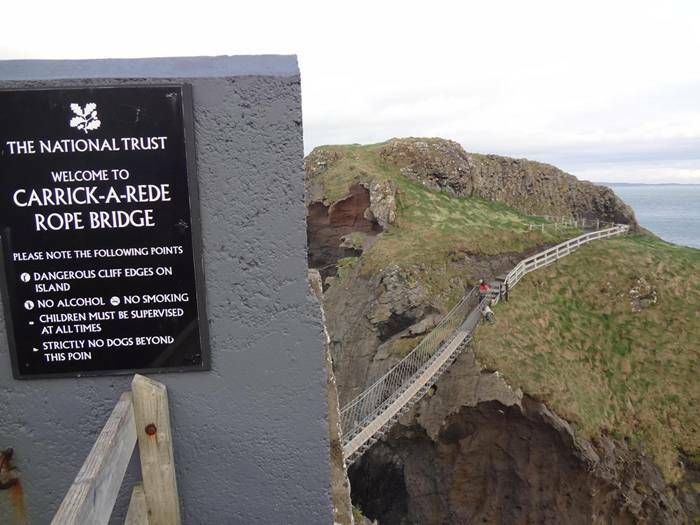 In the entire history of the bridge Carrick-a-Rede there were no cases of falling from it, the bridge is absolutely reliable. But despite this, the transition across the bridge so extreme as some travelers who are able to cross it in one direction, do not dare start the return journey, but prefer a ferry boat. The height of the rope bridge nearly thirty meters above the rocks, the length of twenty meters. 02. Bridges of vines in the Iya Valley, Japan. On the island of Shikoku, the smallest island of Japan, there are three exotic bridges woven from vines over the river Iya-gawa. They were originally made ? ?of wooden planks that are fastened together with vines. Now fortified strong wire bridge and railing, but that does not make it less extreme. The fact that the bridges swing when walking, as in the good old days. 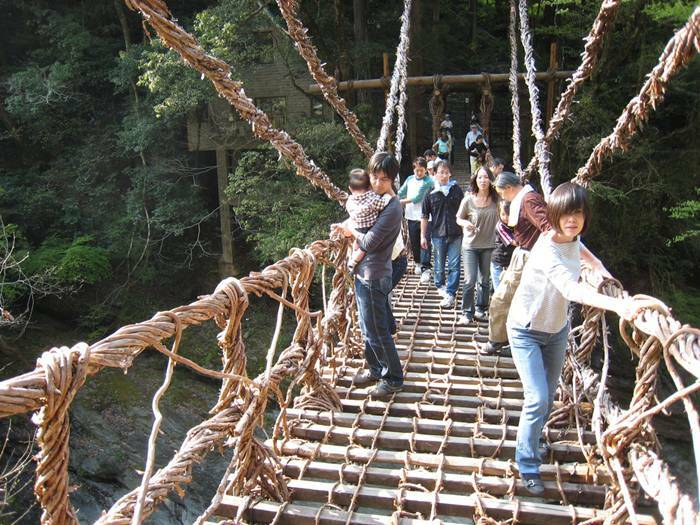 Oh, and, finally, the most dangerous suspension bridge in the world. 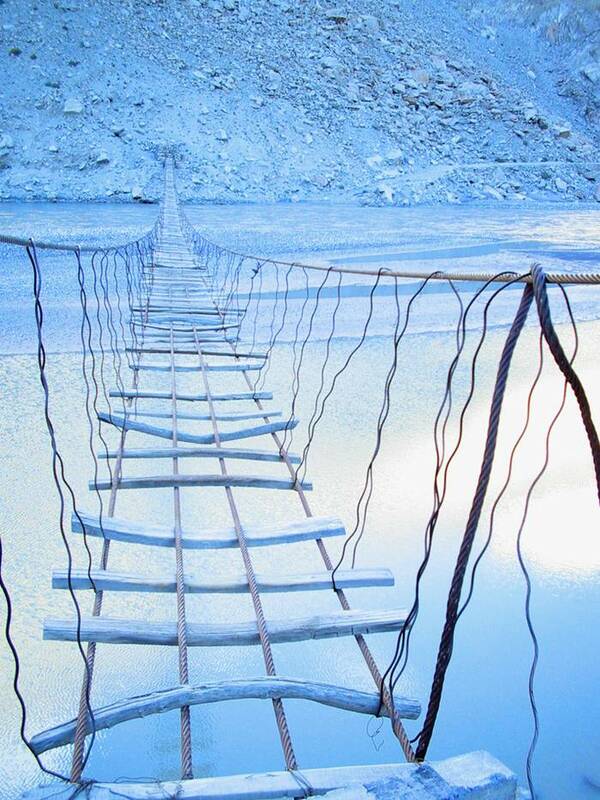 This suspension bridge Hussaini (Pakistan). Hussaini bridge over the River Hunza has a lot of gaps between the planks, and some boards are absent altogether, and the bridge has a rather impressive amplitude of oscillation. In addition, some starting rope bridge rot. The bridge is very old, but the local population is still successfully uses this crossing of the river, and it attracts tourists who want to get a little adrenaline.